One of the effects of a fashion trend is that it makes you feel like there's always something missing in your closet that you absolutely need to have. When the ombre trend - to explain better the effect where the fabric goes light to dark or dark to light - became very popular, my closet was already bursting with clothes but I felt I was missing a pair of ombre pants and cardigan, and I found the pants at Zara and the cardi at Pull&Bear. I personally like this fading color trend, I know it's not going to last for long but I felt like giving it a try both with these pants and cardi, I decided to wear them together to play even more with the dark-light contrast, here you can see the result !. As always, click on the pics to enlarge them. Le mode ci fanno sentire sempre il bisogno di qualcosa di nuovo nell'armadio, qualcosa da avere assolutamente. Quando il trend "ombre" - per spiegarsi meglio l'effetto sfumato dal chiaro allo scuro o vice-versa - si è diffuso, il mio armadio era già pieno di vestiti ma ho avvertito l'impellente necessità di un paio di ombre pants e di un cardigan, che ho trovato rispettivamente da Zara e da Pull&Bear. 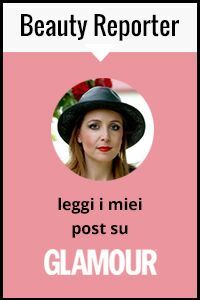 Personalmente mi piace questo trend del colore sfumato, so che non durerà a lungo ma volevo provarlo su di me indossando contemporaneamente sia i pantaloni che il cardigan per esaltare maggiormente il contrasto tra toni chiari e scuri, ecco a voi il risultato !. Come sempre, cliccate sulle foto per ingrandirle. A light denim ruffled shirt from Silvian Heach completed the look, together with my Moschino belt and cobalt blue bag and shoes. I wasn't in my hometown so I didn't have a large choice of bags with me, I would have liked to experiment with a white bag or white shoes in order to play with ombre effect also with the accessories !. 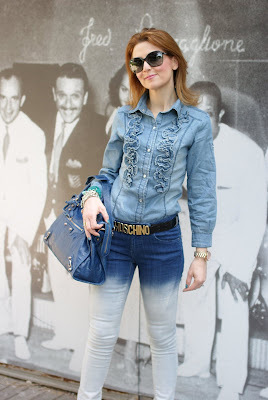 Una camicia leggera in denim di Silvian Heach ha completato il look insieme alla cintura di Moschino e a scarpe e borsa blu cobalto. Non mi trovavo nella mia città e così avevo una scelta limitata di borse con me, altrimenti mi sarebbe piaciuto provare ad abbinare una borsa bianca o scarpe bianche in modo da giocare con l'effetto ombre anche per gli accessori !. I think next time I am gonna wear these ombre pants with white Converse shoes and a simple white tee for an even more casual look. How you would you style them instead ?. Credo che la prossima volta proverò ad indossare questi pantaloni effetto ombre con Converse bianche e una semplice t-shirt bianca per un look ancora più casual. Voi come li abbinereste invece ?. not a look everyone can pull off...but you do so flawlessly! well done. I really like your pants and ruffled jeans shirt a lot! Super cute, I first saw those pants on dulce candy's haul and I wasn't so sure, but I like what you did here, and i love those shoes!!! I pantaloni invece li troppo "netti", sarebbero stati più belli opiù sfumati. Bello questo outfit, ma lo preferisco senza il cardigan giocando solo con i toni del blu..
Love this look, it really suits you!! I loooove the cardigan, the color is perfect! Great outfit. Your ombre pants and cardigan look amazing! Beautiful outfit! love the different blue colours! I like those pants!!! Are amazing!! Questo look mi piace tantissimo!!! Complimenti, è veramente speciale!!! vale, whether it's trendy or not, it does look fabulous on you! i like the blue ruffled top with the pants & blue shoes. the pop of mint is fun. it seems that no matter what i pack for a trip, when i get there, i wished i'd packed something else. i'd rock those pants out with some black boots or heeled sandals. a black t-shirt or flowy black blouse. Sono stupende le scarpe.... Complimenti!!! Fantastic outfit ♥ I love the jeans! The ombre pants trend is one that I can see myself falling for. They look so pretty and fun. Wow, This look is amazing! Loove the ombre pants! P.S. Vote on my blog for my avatars new look! Can't wait to hear your opinion! Me gusta la camisa, muy guapa !!! When I will be rich some day, I am gonna definitely buy this belt, I always admire it! I like the whole jeans combo. Gorgeous photos! I love the ombre trend and it looks great on you! Thank you for visiting and the idea of following each other, I started right now and it would be great if you follow back! 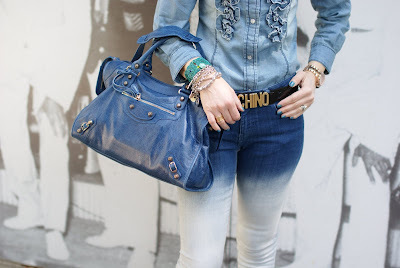 Mi piace un sacco l'outfit, i jeans sono davvero belli! super pants and shoes! and cardigan and... everything!! Cutest outfit! I love the jacket. How beautiful! I love that cardigan! I just adore the colour of your bag - lovely! Not easy to put denim with denim! You did it! :) great! Your outfit is soooo lovely! aww i like so much this outfit !! i like ombre style !! :) look amazing !!! Thank you for lovely comment !!! oh wow.. gorgeous shirt!!!! love it!!! ombre is the latest in fashion now... i'm looking for some ombre items, too! nice post! Great combination of the pants with the blouse! Nice outfit! Totally love your belt! I absolutely LOVE the ombre look! Love how you mixed the cardi with the pants!! and such pretty colors! I absolutely adore your ombre cardigan!!! Such a gorgeous color, and it looks perfect with your amazing pants. Such chic styling, gorgeous! You look gorgeous hon !! Love the two tone Zara denim ! Hi! Your blog is really cute! I saw you post on Beauty is an opinion, and I was wonder if you would like to follow me too? ciao Vale! :) che bella! mi piacciono molto la camicia! :) un bacione! i love the design of your blog!! can i ask you if you know how to centre your image. the image on my blog veers off to the left a bit!! Very nice outfit, I love the vibrant color of the shoes and the hand bag! The trousers would be lovely with flats too, converse or ballerines! I love the blue color palette on your outfit! I looove the ombre/dip dye-ing of your outfit. Actually, followed you via Bloglovin'! I absolutely love those pants! :) followed you! Hope you can also drop by mine! Xoxo from philippines! woww awesome denim style!! I like it sans cardigan darling!!! ^_^ gorgeouss! The jeans are cool and the Moschino belt suits them.